Talent is a great word. I often think about talents; what I discover in friends and the talents I find in myself. There are talents within us, planted there by a wise Heavenly Father--talents to develop, use for good, and enjoy. Often people look at someone who plays the piano beautifully or sings a flawless aria, that they are truly talented. They might be, then again, they may have developed that particular talent with years of practicing. Playing the piano requires hours of working the black and white keys - even if you were born with a musical talent. Some talents are inherited. On my father's side I have traced artistic folks all the way back to the 1600's. Fascinating knowledge that also gives me the feeling of belonging. Sometimes when I am in a classroom and the teacher asks about talents, one that I have comes to mind. It's one that a person usually wouldn't name as a talent. I can see colors for what they are. I can tell which colors are behind a shade, if warm or cold colors are predominant and how the hue is built up. Of course, this comes from years of mixing colors and studying color analysis, but it's also an interest which helps me develop my perception of colors. I admire people around me for their talents. I look up to those who spend their time wisely to make good use of their talents and share them with others. Many of the talents we have been given is exactly for that purpose--to bless others around us. Talents can be physical, spiritual, mind-blogging, artistic . . . the list goes on and on. Even being able to cry can be seen as a talent. Even Hector, the Wheaten terrier, is a talented puppy. He is patient and loving. He is forgiving and willing. 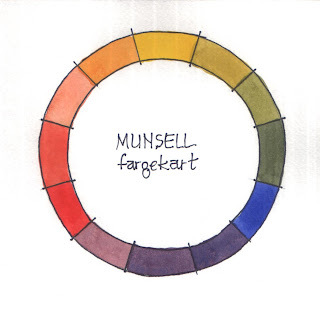 The Munsell color wheel is a reminder to me of a talent that has made me happy all my life. I love to paint, and I love watching good painting. Art history is simply something that brings me a lot of joy.